You're struggling to figure out which way to go. You've had enough of what you're doing right now. You're stuck. Figuring out the why or the what of your next step can be scary and, sometimes, debilitating. It can bring up all the old patterns of procrastination and fear and doubt that tends to do just the opposite.....hold you in place rather than propel you forward. You would think that making even the tiniest of changes should be a walk in the park, right? But making a change in your life, in your job, in a relationship can take you to a level of anxiety that's unreal. But know this. . .change is still possible. It doesn't matter that you haven't a clue what it looks like or how it's gonna happen or the fact that all manner of crazy shite is going on in and around you and you're thinking this cannot be the time to change things up. It is still all possible. The task in front of you is to take that all important first step. I call this phase "The What". First things first, you need to identify the underlying problem. 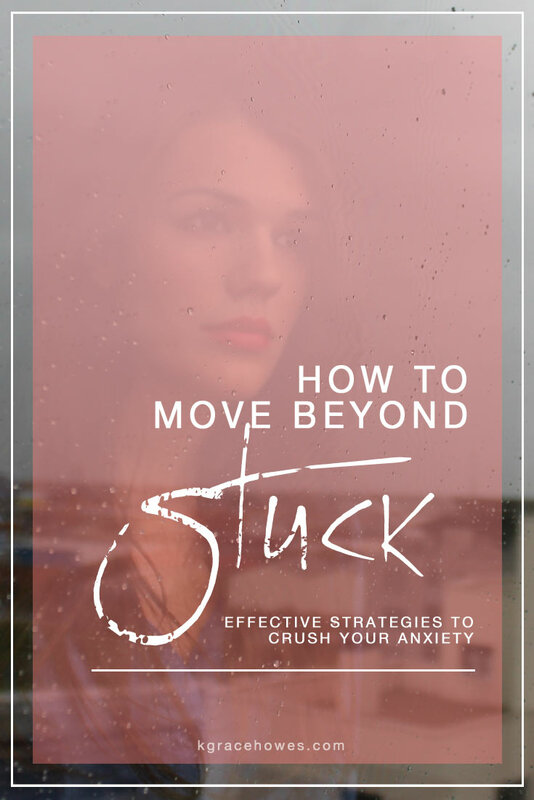 Not knowing where you're stuck makes it hard to figure out how to move beyond it. Take the necessary time to ask the questions and, more importantly, listen for the answers. Figuring out what's holding you back is crucial to removing the block you're experiencing. I think many of you know me as a maker of journals. Well that's putting the cart before the horse a bit. First, I am a journaler, have been for many, many years and it's the one of the first things I think to do when things are muddled up in that grey matter area. So my first advice is to put pen to paper so you can reach inside of you to find yourself, to begin the journey to your what. It's still surprises me over the years when I read back what I have written, how insightful my own written words are. Some small nugget of nested words, that I hadn't picked up on yet, will jump out at me and the insight I gain from them years later is invaluable. That's not to say what you write today cannot help you right now. The purpose of this is to get out of your head and into your heart, into that space inside you that holds all the answers if only you'd care to listen. I call this writing your heartwords. Cause that's exactly what they are....words from your heart to you. Sometimes words are hard to come by, I know. So the next best thing is to play a kid's word association game. For us adults it's called mind mapping (but if you wanna be a kid for an hour instead be my guest) . What does mind mapping do? It tickles the brain to think outside of it's normal parameters, to think outside of the box. Once you start the process, and the word association gets going, there's no telling where you'll end up. And THAT, hon, is the point. We are all really good at putting constraints on ourselves, at limiting our thoughts and our capabilities. This exercise to help you find your 'what' does the trick of getting us outside of our comfort zone thinking to access those deeper desires of ours we often keep hidden from view, even from ourselves. Sometimes the act of just speaking your thoughts out loud can give a little breathing space to an issue and ease the constant think that seems never ending. And, the beauty of talking to a trusted friend or family member is that you’ll also get the extra support you might need. Talking things out lets you bring some light to a situation, allowing space for a solution to show up. It can help release some of the pressure you feel trying to make that hard decision. Talking it out means you’ll have another person working on your behalf. As you work together to brainstorm possible ideas to get unstuck. Although words are my go to, I am a visual person. I see things in pictures all the time. Wouldn't it be lovely to conjure up some images to fit the words you wrote, maybe even to visualizing the future you want. Or, if you choose not to write words first, I invite you to sit quiet and still for a few minutes then pull out your books of images and cut what you felt, what you witnessed in that quiet meditation. Go on a journey with yourself and allow whatever comes up to just be. Don't censure yourself. If an image resonates but it doesn't make sense to you at the moment, tear it out anyway. Recently, in an online course I took, the assignment was to find my Spirit Guide. Easy enough right? I gotta tell you tho, this task was actually hard for me. After 2-3 minutes of leafing through a few magazine trying to see what images, if any, resonated, I came across one of a redheaded girl. I stopped for a quick sec then quickly turned the page. A redhead? For me? Surely not…right? (have you seen a pic of me???? ?, lol) But, as I scrolled through page after page, she kept calling to me. In the end I had to listen to my intuition and go back to tear it out to glue into my journal. She's my carefree playful side. Her job is to get me to that place of carefree, giddy, dancing with the kids in the middle of the kitchen, trying new & different things, enjoying the moments of pure JOY, just because and anything else she can think of for me to stop and enjoy life. She has me thinking less about lack and more about living life to the fullest. She’s also there to help me step more into “done is good enough”. Because that perfection thing is definitely overrated and she's got other, more fun things in mind for my time. Remember, what we resist persists. Think about this.....getting stuck is the Universe’s way of letting you know that change needs to happen. What worked before is not a part of the picture anymore and no amount of trying to force things a certain way or getting stuck in the shoulda, coulda, woulda mind game will move you from that place of stuck. It’s time for a new way of thinking. If things are pulling at you from all sides, first try a few of the suggestions I mention above. From darkness there can be light. Begin with this. p.s. What's worked for you to get you out of stuck? Leave a comment below to share your experience.